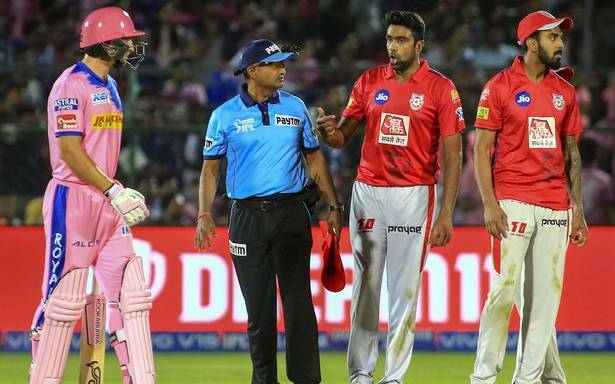 The Rajasthan Royals were chasing 185 runs in the first group stage match of their IPL 2019 campaign when a (needless) controversy ensued. The match seemed to be firmly in the control of the Royals in the 13th over — they were comfortably placed at 108/1 — when Ravichandran Ashwin ran out the dangerous Jos Buttler, who backed up just a bit too far for his own good. Run-outs do not normally warrant raised eyebrows; but this was that specific form of run-out — ‘Mankading’ that has remained controversial for over 70 years. Once again, an instance of it produced plenty of chatter amongst fans and commentators alike. Ashwin, just getting into his delivery stride, caught Jos Buttler short of the crease at the non-striker’s end and proceeded to run him out. Ardent cricketing fans would have made note of the ‘Mankading’; for the casual fans, one more word would have entered their cricketing vocabulary. While an incident like this has probably ruined many playing relationships in gully cricket itself, one can only imagine the uproar this incident has caused in the cricketing world, where the stakes are much higher. And yet, I still wouldn’t say Ashwin did anything wrong. But the cricketing world seems to be divided on the lines of “spirit of cricket”. The term ‘Mankading’ comes from the legendary Indian all-rounder Vinoo Mankad who famously ran out Bill Brown in the 1947 Test at Sydney. In fact, it was the second time that the batsman had been caught short in this fashion by the same bowler; in an earlier tour match, Mankad had dismissed him similarly after multiple warnings. Since then, the name Mankad has become a cricketing verb. As it has happened now, back then too, there was heavy controversy. However, the Australian captain Don Bradman himself had defended Mankad’s actions. I’m firmly in Sunil Gavaskar’s camp — that the term “Mankad”, which has negative connotations, has to be removed from the cricketing vocabulary as it is not referring to the person who committed the mistake in the first place (or alternatively, has to be rid of its negative connotations). Ashwin received plenty of bouquets and brickbats for his actions (with no fingers being pointed at Jos Buttler). The Indian offspinner received support from many players, including the former India spinner-turned-commentator Murali Kartik, who commended him for the act. Interestingly, Murali Kartik himself was in the eye of similar storms many years ago (with Surrey throwing him under the bus in the first occasion). A similar action by the West Indies U19 team in 2016 was decried by the cricketing moral police; whereas in the 1987 World Cup, Courtney Walsh refused to run out the last man Saleem Jaffar and the West Indies ended up on the losing side — Walsh was lauded for his “sportsmanship”. What do the laws of the game have to say about this? ◘ If the non-striker is out of his/her ground from the moment the ball comes into play to the instant when the bowler would normally have been expected to release the ball, the bowler is permitted to attempt to run him/her out. Whether the attempt is successful or not, the ball shall not count as one in the over. ◘ If the bowler fails in an attempt to run out the non-striker, the umpire shall call and signal Dead ball as soon as possible. Earlier, this was part of law 42.15. In 2017, it was changed to the present-day version where the onus is on the batsman to stay within the crease. Under the previous rule, bowlers could only run out the non-striker only before entering their bowling stride; now, this can be affected at any instant until the bowler bowls the ball. Additionally, followers of the game can intuitively understand that the batsman is trying to gain an unfair advantage by backing up too far; a batsman six inches ahead of the crease has six inches fewer to cover in order to complete a run. Earlier, a “gentleman’s warning” was usually expected before any action was taken, but the latest amendment puts the responsibility of staying in the crease on the batsman. Besides, no warning has to be given before a stumping, isn’t it? A bowler overstepping even by a millimetre is a no ball as well. Then why should the batsman get away with gaining unfair advantage without repercussions? Therefore, what Ashwin did is absolutely legal in terms of the letter and spirit of the law. The laws of the game make it clear that it was, if anything, unfair play on the part of the batsman to be out of his crease before the ball had been delivered. Hence, Jos Buttler should have been fined for showing dissent after the third umpire correctly ruled him out. It is interesting that the dismissal has attained pejorative connotation and is referred to by the name of a bowler rather than the batsman who actually sought to gain an unfair advantage to begin with. For some reason, perhaps arising out of the double standards the game has for batsmen and bowlers, an act of running a batsman out when he is out of his crease while the ball is in play is controversial and is perceived as being unsportsmanlike. The game of cricket especially prides itself on the concept of fair play. In fact, English has an idiom, “It’s not cricket”, which denotes that something is unsportsmanlike. But it is also true that the game treats the batsman, the more privileged player, with kid gloves. The batsman moves far lesser than the bowler or the fielder; the benefit of the doubt goes to the batman (rightly so in Test cricket, not so much in the limited formats); What is more, an umpire can rule a batsman out only after an appeal by the bowling side (unless the dismissal is obvious such as a bowled which may prompt the batsman to walk). Meaning, if a fielding side fails to appeal, the umpire cannot technically rule a batsman out. Therefore, it is no surprise that the batsmen are the protected species; one would be hard-pressed to find many examples of aristocrats and gentry being bowlers — they were usually batsmen. The blue-collar job of fast bowling was reserved for people from more modest backgrounds (or as the saying in England went, someone who worked in a coal mine). The needless controversy over this run-out stems from the hypocritical and nebulous concept of “spirit of the game” while it is crystal clear where the fault lies: with the batman who has tried to gain an unfair advantage. It is great that the ICC changed the law in 2017 to remove the grey areas and put the spotlight on the batsmen, as it should be. If anything, the amendment and the incident will serve as a warning to erring batsmen.